Kissing the border of Canada and stretching more than 1.3 million acres across the state's farthest-flung farms, fields and forests, northeastern Vermont — aka the Northeast Kingdom — really heats up when the snow falls. That's when winter's whiteout turns the regal hills and mountain peaks otherworldly. Many find their keys to the Kingdom at Jay Peak, a 3,862-foot summit an hour and a half drive from Burlington, and two hours from Montréal. From there, it's just a hop, skip and jump to the region's Québécois-influenced cuisine, world-class performing arts and off-the-beaten-track sporting spots. From the squeals of the Sherburne Express lift cranking up Burke Mountain to the whoops and hollers of cross-country skiers on the Kingdom Trails, it's hard to stay quiet about the royal flush of recreational opportunities — indoors and out — in the Northeast Kingdom. Jay Peak Resort is the only place in the country where you can drop down snowy chutes in the morning before dropping down La Chute — a waterslide with a 60-foot free fall — in the afternoon. 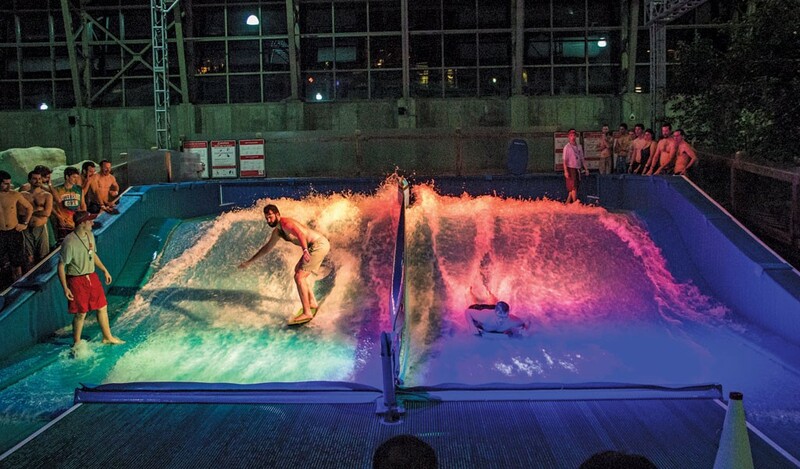 The watery fun is at the Pump House Indoor Waterpark, added to the ski area in 2011. The year-round temperature in the 50,000-square-foot indoor playground is a balmy 86 degrees Fahrenheit, with 104-degree hot tubs. Hot toddies at the poolside bar complete the job of warming up the winter-weary. The resort also offers the indoor Ice Haus skating arena, a covered tram to take you to the top of the mountain and, of course, plenty of outdoor action skiing and riding Jay's 385 acres of terrain. 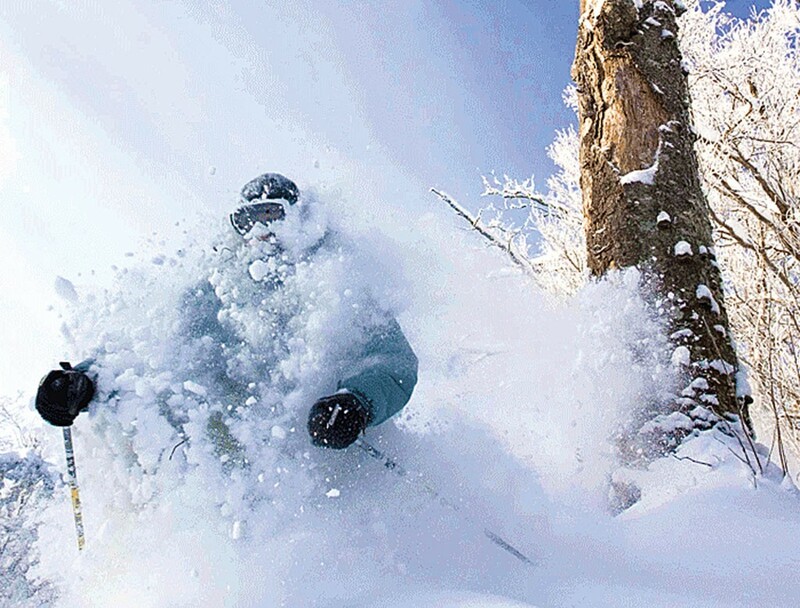 Thanks to the "Jay Cloud," a weather phenomenon that brings an annual average of 355 inches of snow — unusual in Vermont — powderhounds can almost always sniff out fresh flakes in glades such as André's Paradise and Valhalla. First-timers can learn their turns off an easy "magic carpet" before getting their own friendly test of the trees in Moon Walk Woods. Intermediates can cruise down long groomers such as Alligator Alley. It's the perfect way to end the ski day before jumping into the Pump House's Lazy River. Nordic skating is the wild and wilderness-seeking cousin of figure skating, unbound by arenas, rinks or rules. 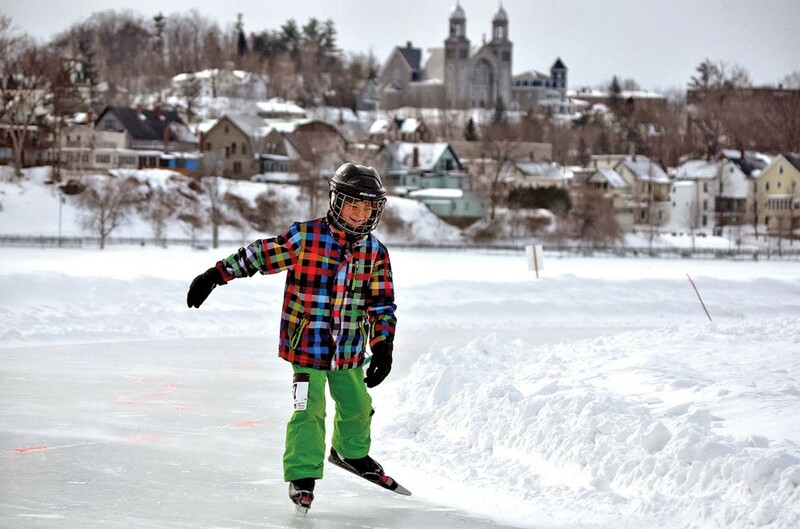 Lake Memphremagog, a 32-mile-long glacial lake that spans Québec and Vermont, is one of the best places to experience the sport's long-distance thrills on silky-smooth black ice. Equipped with long-bladed skates, Nordic enthusiasts can go as fast as 25 miles per hour, meaning they can cross into Canada faster than cars do at paved border crossings. Originally from the Netherlands, the sport is just getting its legs in the Northeast Kingdom, with Nordic skaters working on multi-mile trails along the lake. Rent skates at the Great Outdoors in downtown Newport, and find more information on the sport at nordicskater.com, a website run by Vermonter and athlete Jamie Hess. The wonders of cross-country skiing — feeling your lungs expand with crisp, cold air as your legs propel you through snow-covered woods and fields — increase exponentially on this 15-kilometer network of pristine trails. One particular stretch, on Darling Hill, has even been called the "prettiest mile in Vermont." Kingdom Trails in East Burke represents a unique collaboration: Fifty northern Vermont landowners, businesses and a nonprofit teamed up to ensure year-round recreational access to nonmotorized routes for athletes of all abilities. In summer, mountain bikers hit a broad swath of singletrack; in winter, the dedicated cross-country terrain complements 30 more kilometers of trails packed for snowshoeing and specially equipped bikes. Don't miss the view of Willoughby Gap from Darling Hill. And leave enough energy in the tank for tubing or sledding at the Kingdom Trails Nordic Adventure Center. World Cup superstar and Olympian Mikaela Shiffrin perfected her slalom skills at Burke Mountain, a peak that stands out not only geologically (it's a monadnock) but also for its local reputation, thanks to the resort's low-key vibe. The 270-plus skiable acres accompany more than 100 acres of maintained tree skiing and three terrain parks. Beginning skiers and riders can find plenty of rookie-friendly runs on the lower part of the mountain — it's all "green" runs except for one "blue" intermediate trail. The summit offers steep pitches, such as Doug's Drop, for athletes with loftier ­— or Olympic ­— aspirations. From the outside, Fairbanks Museum & Planetarium catches the eye with its dramatic Richardsonian Romanesque architecture — all stone arches and turrets. Inside, the eye doesn't know quite where to land. Founded by Victorian collector Franklin Fairbanks in 1889, this cabinet of curiosities contains more than 175,000 eclectic, historical objects. Ranging from a stuffed polar bear to Civil War documents to an alligator mummy from ancient Egypt, the unusual artifacts were intended to bring the world to St. Johnsbury at a time when few traveled beyond the state's borders. Today, the museum honors that tradition while broadening its boundaries. Daily astronomy shows in the Lyman Spitzer Jr. Planetarium celebrate the cosmos. 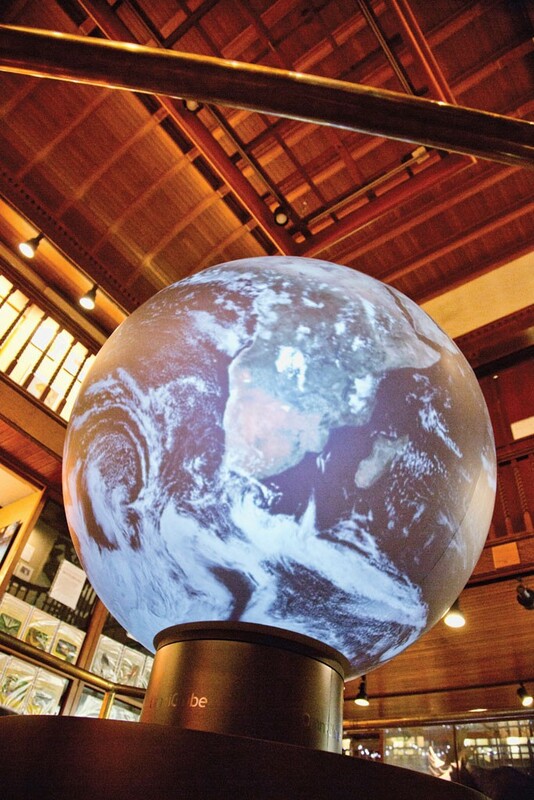 A massive, interactive sphere called the OmniGlobe lets visitors investigate Earth's ocean currents as well as the sands of Mars. And the Vinton Space Science Gallery displays photos taken by the Hubble Space Telescope. Whichever planet you explore while you're at the Fairbanks, rest assured knowing there's no other place quite like this museum on ours. Since its 1975 inception, Catamount Arts in downtown St. Johnsbury has grown into the Kingdom's main hub for live performance and film. Housed in a former Masonic Lodge, the arts center includes two movie theaters, three art galleries and an 80-seat performance space. That last plays host to music, drama and dance from community troupes and internationally touring acts. 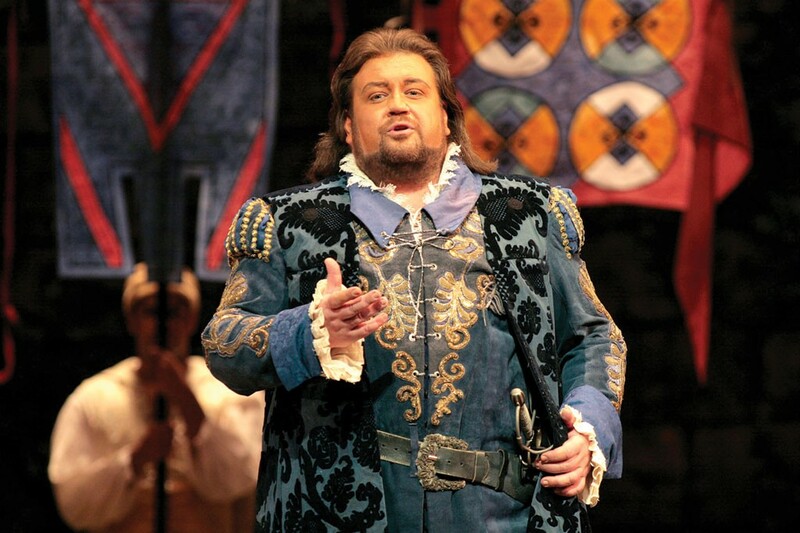 As a regional box office and partner of more than 20 local presenters, Catamount Arts functions as the gateway to northeastern Vermont's lively arts scene. Its name is a mouthful, but the mission of the Memphremagog Arts Collaborative (MAC) Center for the Arts is simple: to support and celebrate the arts. With more than 50 Vermont artists, crafters, writers, musicians and performers involved, it's safe to say the business plan is working. Located on Newport's main drag, this 4,000-square-foot community center is divided into two spaces: a street-level showroom for local visual art and handcrafts; and the Art Cellar Gallery, which hosts visiting exhibits, lectures and free art classes for youngsters. Stop in to see handmade pottery, furniture, painted kimonos, handspun wool and, if you're lucky, a local artist busy at work. Parts of the Northeast Kingdom were once considered "food deserts" — areas lacking access to affordable fresh ingredients. These days, the region is experiencing something of a culinary renaissance. It's home to Greensboro's Hill Farmstead Brewery (often lauded as the world's best) and Jasper Hill Farm's award-winning cheeses, not to mention craft distilleries, farmers markets and community gardens. Here's a rundown of a few restaurants — and one "tasting center" — that serve stick-to-your-ribs comfort food after your ice-bound adventures in the Kingdom. Three fireplaces warm this hip, reimagined version of a hunting lodge. 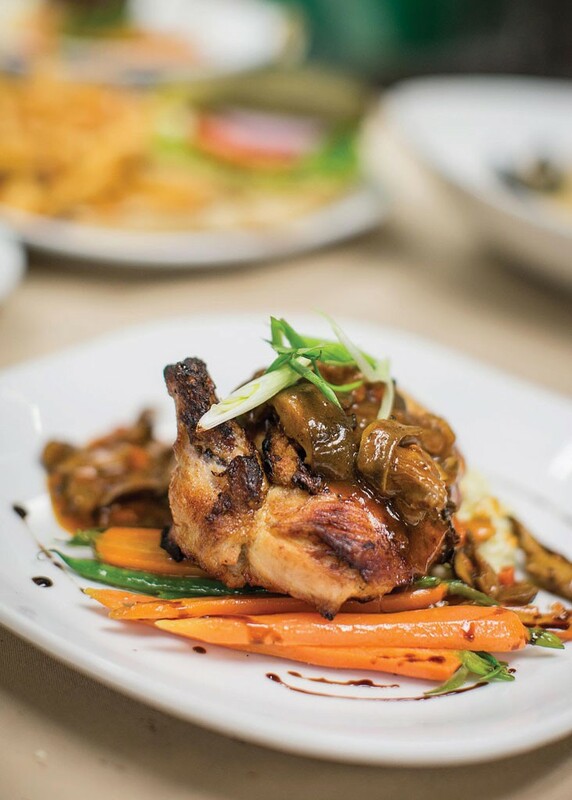 The pub menu includes international dishes as interpreted by chef Jason Chartrand. Items range from down-home burgers and ribs to braised-pork wontons and creatively sauced racks of lamb for sophisticated visitors. At this locavore market and tasting room, dozens of Vermont artisans sell their wares, which range from honey and syrup to fresh breads, jams, meats, cheeses, wines, ciders and spirits. Not in the mood to cook? The center's Brown Dog Bistro serves Vermont-inflected versions of mac and cheese and meaty cassoulet. Looking for fine Mediterranean dining on the shores of Lake Memphremagog? Options at this award-winning restaurant include grilled flatbread pizzas, frutti di mare and a 16-ounce rib eye stuffed with Gorgonzola. The wine list boasts bottles ranging in price from $10 to $200. This upscale eatery has stunning views of Lake Memphremagog. New England Culinary Institute-trained chef Jason Marcoux puts a creative spin on tapas as well as pasta, seafood and local meats. Thursday is sushi night, when Marcoux prepares a mix of classic rolls and original creations. Entrées at this comfortably upscale restaurant overlooking a river are grouped by "land," "vine," "sea" or "sky." Creative dishes include pastas, salads and other hearty dinners incorporating a wide variety of proteins. Lunch is served Friday through Sunday, brunch Sunday only, dinner all week. You might find yourself rubbing elbows with the building owner, Grammy-nominated singer-songwriter Neko Case, as you dine on guacamole chicken melt or French onion soup at this cozy café. The 1920s-era former post office building is home to Catamount Arts' Annex Gallery. Le Jay Peak Resort (jaypeakresort.com) est le seul endroit aux États-Unis où l'on peut dévaler les pentes de ski enneigées le matin et se laisser descendre dans une glissoire d'eau de 18 m (La Chute) l'après-midi. Au parc aquatique Pump House Indoor Waterpark, qui s'est ajouté aux installations de la station de ski en 2011, il fait 30 degrés Celsius à l'année. Dans ce terrain de jeu intérieur de 4 650 m2, vous pouvez aussi vous prélasser dans des spas à 40 degrés et déguster des boissons chaudes au bar, près de la piscine – tout ce dont on a besoin pour se réchauffer l'hiver! La station comporte également une patinoire intérieure, la Ice Haus, et un téléphérique qui vous transporte, à l'abri du froid, jusqu'au sommet de la montagne. Et bien entendu, dans ce domaine skiable de 385 acres, les skieurs et les surfeurs ont l'embarras du choix. En raison d'un phénomène climatique nommé Jay Cloud, il tombe en moyenne 9 m de neige chaque année dans le secteur, ce qui est inusité pour le Vermont. Les amateurs de poudreuse trouvent donc presque toujours des flocons fraîchement tombés dans les sous-bois de la station, dont André's Paradise et Valhalla. Les débutants peuvent s'exercer en lieu sûr avant de se lancer à leur tour dans le sous-bois pour novices Moon Walk Woods, tandis que les skieurs intermédiaires peuvent descendre de longues pistes damées, comme l'Alligator Alley. Quoi de mieux pour terminer une journée de ski, avant de sauter dans la Lazy River du Pump House? Le patinage nordique est le cousin plus libre, plus « sauvage », du patinage artistique : il ne se pratique pas sur une patinoire bien définie et n'est régi par aucune règle. Le lac Memphrémagog, un lac glaciaire long de 50 km qui s'étend sur le Québec et le Vermont, est un des meilleurs endroits pour apprécier ce sport de longue distance, sur de la glace noire archilisse. Chaussés de leurs patins à longue lame, les patineurs se déplacent à une vitesse pouvant atteindre 40 km/heure; ils peuvent donc entrer au Canada plus rapidement que les voitures, qui doivent faire la file aux postes frontaliers. Originaire des Pays-Bas, ce sport en est à ses débuts dans le Northeast Kingdom, où les adeptes parcourent des pistes de plusieurs kilomètres sur le lac. Vous pouvez louer des patins à Great Outdoors (greatoutdoorsvermont.com), au centre-ville de Newport, et en apprendre davantage à nordicskater.com, site Web de l'athlète vermontois Jamie Hess. Les joies du ski de fond – se remplir ses poumons d'air frais dans des sous-bois et des champs enneigés – sont multipliées dans ce réseau de 15 km de pistes aux conditions idéales. Un tronçon de la Darling Hill a d'ailleurs été baptisé « le plus joli mille du Vermont ». Les Kingdom Trails (kingdomtrails.org), à East Burke, sont le fruit d'une collaboration unique entre 50 propriétaires, entrepreneurs et OSBL du nord du Vermont, visant à offrir toute l'année aux sportifs un accès à des zones récréatives sans véhicules motorisés. L'été, les vététistes ont l'embarras du choix parmi les pistes à dévaler et l'hiver, le secteur ski de fond s'ajoute aux quelque 30 kilomètres de pistes damées que prennent d'assaut les raquetteurs et les amateurs de vélos adaptés à la neige. Admirez la vue du Willoughby Gap depuis la Darling Hill. Et gardez-vous assez d'énergie pour les descentes en luge ou les glissades sur tube au Kingdom Trails Nordic Adventure Center. Mikaela Shiffrin, superstar de la coupe du monde et athlète olympique, a perfectionné son slalom à Burke Mountain (skiburke.com), qui se démarque non seulement pour des raisons géologiques (c'est un monadnock), mais également pour l'ambiance décontractée qui a fait la réputation de la station à l'échelle locale. On y trouve une superficie skiable de 270 acres, plus de 100 acres de pistes en forêt et trois parcs de surf. Le bas de la montagne est largement adapté aux skieurs et planchistes débutants : toutes les pistes sont « vertes » (faciles) sauf une, qui est « bleue » (intermédiaire). Au sommet, les athlètes plus ambitieux – Olympiens ou pas – peuvent s'élancer à l'assaut de pentes abruptes, comme Doug's Drop. De l'extérieur, le Fairbanks Museum & Planetarium (fairbanksmuseum.org) attire l'attention grâce à son architecture spectaculaire de style roman richardsonien, caractérisé par des arcs et des tourelles de pierre. À l'intérieur, on ne sait pas trop où poser les yeux. Fondé par le collectionneur victorien Franklin Fairbanks en 1889, ce cabinet de curiosités renferme plus de 175 000 objets historiques éclectiques. Un ours polaire empaillé, des documents datant de la guerre de Sécession, un alligator momifié de l'Égypte ancienne – autant d'artefacts inusités qui ont été apportés jusqu'ici pour faire découvrir le monde aux habitants de St. Johnsbury, à une époque où ils étaient peu nombreux à sortir de l'État. Aujourd'hui, cette tradition se perpétue au musée, qui a élargi ses horizons. On célèbre le cosmos lors de spectacles présentés tous les jours au planétarium Lyman Spitzer Jr. Une imposante sphère interactive, l'OmniGlobe, permet aux visiteurs de mener leurs propres enquêtes sur les courants océaniques de la Terre et les sables de Mars. À la Vinton Space Science Gallery, on peut admirer des photos du télescope spatial Hubble. Peu importe la planète que vous explorez au Fairbanks, vous ne trouverez aucun autre endroit comme ce musée sur la Terre! Depuis sa fondation en 1975, le Catamount Arts (catamountarts.org), au centre-ville de St. Johnsbury, est devenu le principal centre de spectacles et de projection de films du Northeast Kingdom. Situé dans une ancienne loge maçonnique, il comprend deux salles de cinéma, trois galeries d'art et une salle de spectacles de 80 places. C'est dans cette dernière que se produisent divers groupes de musique et troupes de théâtre et de danse de la communauté et du monde entier. Billetterie régionale et partenaire de plus de 20 diffuseurs locaux, Catamount Arts constitue en quelque sorte la porte d'accès à la scène artistique du nord-est du Vermont. Son nom est un peu long, mais la mission du Memphremagog Arts Collaborative (MAC) Center for the Arts (memphremagogartscollaborative.com) se résume en peu de mots : soutenir et célébrer les arts. Et on peut dire que son plan d'affaires est une réussite puisqu'une cinquantaine d'artistes, d'artisans, d'écrivains, de musiciens et d'interprètes du Vermont s'y sont associés. Situé sur la rue principale de Newport, ce centre communautaire de 370 mètres carrés est divisé en deux espaces : au niveau de la rue, une salle d'exposition consacrée à l'artisanat et aux arts visuels locaux, et la Art Cellar Gallery, qui accueille des expositions itinérantes, des conférences et des cours d'art gratuits destinés aux jeunes. Arrêtez-vous quelques instants pour admirer pièces de poterie, meubles, kimonos colorés, laine filée à la main et, si vous êtes chanceux, vous pourrez observer un artiste local à l'œuvre. Certains secteurs du Northeast Kingdom ont déjà été considérés comme des « déserts alimentaires », où il était difficile de se procurer des produits frais à un prix abordable. Aujourd'hui, la région connaît une « renaissance culinaire ». On y trouve la Hill Farmstead Brewery de Greensboro (souvent saluée comme la meilleure brasserie au monde), les fromages primés de Jasper Hill Farm, des distilleries artisanales, des marchés de producteurs et des jardins communautaires. Voici quelques restaurants et un « centre de dégustation » offrant des mets réconfortants qui sauront vous réchauffer après vos activités hivernales. Trois foyers réchauffent ce pavillon de chasse moderne, dont le pub offre des plats internationaux à la manière du chef Jason Chartrand. On y déguste des hamburgers et des côtes levées sans prétention, des wontons au porc braisé et des carrés d'agneau nappés de sauces minutieusement élaborées pour plaire aux visiteurs les plus exigeants. Le menu du chef propriétaire Jeff Weiss, composé de mets américains réconfortants, change chaque soir et tire parti d'ingrédients régionaux de saison. Le bœuf Angus certifié et l'agneau sont des incontournables, tout comme la poutine. Nous vous conseillons le magret de canard aux cinq épices nappé de sauce gastrique aux mûres et accompagné d'un soufflé aux patates douces. Des dizaines d'artisans du Vermont présentent leurs produits à ce marché et centre de dégustation pour locavores, où vous découvrirez miels, sirops, pains frais, confitures, viandes, fromages, vins, cidres et spiritueux. Pas le temps de préparer le repas? Le Brown Dog Bistro vous offre son macaroni au fromage et son cassoulet à la viande d'inspiration vermontoise. On ne s'attend pas à déguster une cuisine méditerranéenne gastronomique sur le lac Memphrémagog. Et pourtant, le menu de ce restaurant primé, dont le chef est aussi le propriétaire, inclut des pizzas à pâte mince, des fruits de mer et un faux-filet de 450 g farci au gorgonzola. Sur la carte des vins, vous trouverez des bouteilles de 10 $ à 200 $. Cet élégant espace-restaurant offre une vue imprenable sur le lac Memphrémagog. Jason Marcoux, chef formé par le New England Culinary Institute, réinterprète les tapas, les pâtes, les fruits de mer et les viandes locales en laissant libre cours à son imagination. Jeudi rime avec sushi : ce soir-là, le chef offre rouleaux classiques et créations originales. Les plats principaux de ce chic restaurant surplombant une rivière sont regroupés selon qu'ils évoquent la terre, la vigne, la mer ou le ciel. Les mets créatifs incluent des pâtes, des salades et d'autres plats copieux comportant une grande variété de protéines. Lunch du vendredi au dimanche, brunch le dimanche seulement et souper tous les soirs. Pas impossible que vous aperceviez l'auteure-compositrice-interprète Neko Case, nommée pour plusieurs prix Grammy et propriétaire de l'immeuble, pendant que vous dégustez le poulet au guacamole ou la soupe à l'oignon. Ce café accueillant, qui fut un bureau de poste dans les années 1920, abrite aussi la galerie annexe du Catamount Arts. The original print version of this article was headlined "Kingdom Come"